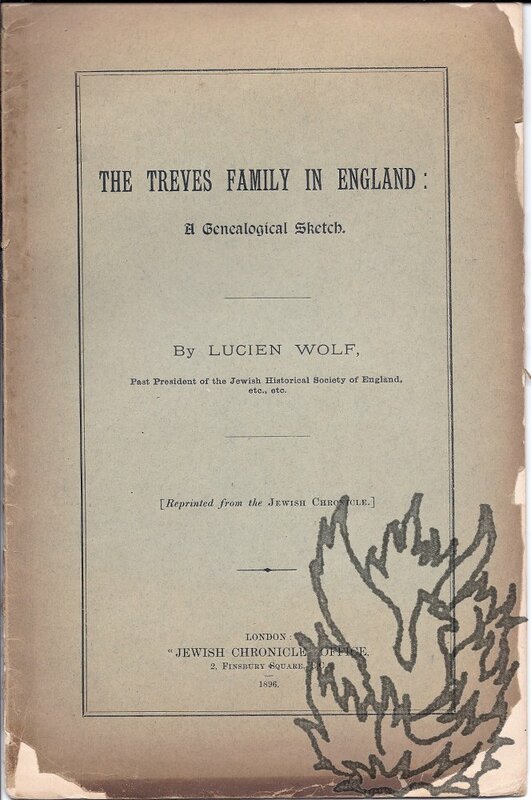 [Offprint from the 'Jewish Chronicle'] The Treves Family in England: A Genealogical Sketch. By Lucien Wolf, Past President of the Jewish Historical Society of England, etc., etc..
London: "Jewish Chronicle" Office, 2, Finsbury Square, E.C. 1896. 8vo, 20 pp. In original grey printed wraps. Text clear and complete. A fair copy, on lightly-aged paper; wraps discoloured and chipped. 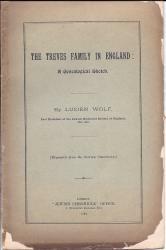 Printed in small type, with 123 footnotes, and containing a mass of information. This separate printing is excessively scarce: no copy at the British Library, and the only copy on COPAC at Sheffield.